Chilean writer Ariel Dorfman sent an ‘Imaginary Letter’ allegedly written by Salvador Allende to Señor Presidente Nicolás Maduro.1 The author of the celebrated essay How to read Donald Duck : (with Armand Mattelart) and of the play Death and the Maiden, a. o. works, claims he felt he had to imagine what kind of advice the President of Chile (1970-1973) would have offered his Venezuelan colleague, who sees Allende as a hero and a model. The device raises an ethical question. Can an opinion, however ‘imaginary’ be projected upon the martyr president about the current government of Venezuela? Let us first look at what it says. Contrary to those who are out against Nicolás Maduro and deny any parallel between 1973 Chile and 2019 Venezuela, Ariel Dorfman acknowledges similarities between the destabilization of the Chilean government and what is happening in Venezuela. He explains that in 1973 Nixon, Kissinger and the US corporations joined forces against Chile while today Trump, Pence, Pompeo and Elliot Abrams are at the helm. Their aim is fairly limited: to oust you, the constitutional president of Venezuela, through the force of arms. There is no hint in the ‘Letter’ to the fact that they aim at destroying Chavez’ redistributive project so as to make it possible for corporations to own oil resources. Next, rather unimaginatively, the ‘Letter’ rehashes common charges: strong authoritarian tendencies; limitations to opponents’ freedom of association and to the freedom of the media; opponents who are arrested and tortured because of their opinions; ‘humanitarian disaster plaguing Venezuela’. Similar charges where formulated against Salvador Allende forty years ago, except for the last one: humanitarian interference is a 21st century invention. Indeed on 22 August 1973, the Chilean opposition, which held a majority of seats in Parliament voted a text that charged Allende with wanting to set up a ‘totalitarian’ system. He was said to have ‘created illegitimate parallel forms of power,’ ‘usurped’ prerogatives of the parliament and of the judiciary system; to deny freedom of speech, of meeting, of education and freedom to leave the country. He was also said to have ‘infiltrated’ the army. Conclusion: the army was called to immediately put an end to the situation described above. Nowadays these charges are perceived as shameful nonsense, except by those who still vindicate the coup on account of the majority in Parliament. But in 1973, they were so relentlessly repeated in the opposition media that simultaneously controlled information and claimed they had no freedom that they were accepted as ‘truth’. A significant part of the population, who thought Allende was an abject figure, rejoiced at his being ousted. As in Chile in 1973, Venezuela in 2019 is presented through fake news about ‘exactions’ to demonize the government and so justify its overthrow. It is therefore important to check them carefully before releasing them. Unfortunately, the author of our ‘Letter’ has not checked his sources, for instance when he has Allende ‘say’ that Nicolás Maduro can rely on Russia and China’s support ‘whereas I asked what was then the Soviet Union for help and received not a penny in aid’. Reliable sources on Allende’s visit to the USSR in December 1972 indicate that Moscow granted Chile a loan for a significant amount, though not as high as the U$80 million the Chilean government had asked for. The minister for planification Gonzalo Martner, who was a member of the delegation, mentioned U$45 million; Allende’s adviser Joan Garcés claimed that the USSR granted U$27 in raw material and food and added U$20 million to an earlier loan of U$80 million. 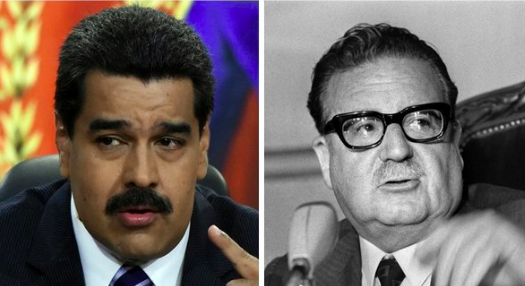 Finally, Allende blames Nicolás Maduro for the way he has run his country and tells him: ‘I decided to hold a referendum that would allow the people to determine the road that our country should take’. Now, referendums and elections are common enough in Venezuela. From 1999 to 2019 the country could choose the road it should take on the occasion of six elections of governors, six referendums, three municipal elections, two elections for a constituent assembly, for the MPs and five presidential elections. In all of these except two the Chavist road was chosen. Let us also note that giving this kind of advice to other countries was not something the Popular Unity government would have condoned: its international policy consisted in substituting ‘ideological pluralism’ for the ‘ideological borders’ of the Cold War and in promoting the principles of peoples’ self-determination and of non-interference. Allende stood for the right of each country to choose its own road. On the other hand, his government had shown its solidarity with Vietnam, when bombed by the US, and indicted the boycott against Cuba, which suffered from a disinformation campaign and an economic war similar to what is currently waged against Venezuela. Several intellectuals, including some who were close to the Allende government, sent an open letter to Michelle Bachelet, UN High Commissioner for Human Rights.2 The consequences of the ‘economic sanctions’ enforced by the US on Venezuela, which resulted in U$ 23 billion losses, are a key issue and they asked her to do something about it. The objective of those ‘sanctions’ is to prevent the country’s economic recovery and to starve the people to ‘accelerate collapse’, in the words of William Brownfield, former US ambassador in Venezuela. Such aggression against the population violates the UN Charter, the International Covenant in Civil and Political Rights as well as the International Covenant on Economic, Social and Cultural Rights, and more generally International Law. Let us go back to the initial question: can we accept, in the name of artistic freedom, that anyone should imagine words a real character never said? More recently, in a film that presents an ‘imaginary’ reconstitution of the day of the coup, the author first invented a phone call in which Allende and the President of the Socialist party disagreed; then staged the coalition parties disavowing Allende, which they never did, and last has the President acknowledged, while the palace is being bombed, that his management had been a ‘failure’. Víctor Pey was involved in a similar situation since the Spanish Republican who had arrived in Chile in 1939 and had soon befriended Salvador Allende and Pablo Neruda, was presented in Pablo Larraín’s film Neruda as the traitor who told on the future Nobel-prize winner to the police whereas facts show that he had been among those who helped Neruda to escape. Before he died last year at 103, Pey had brilliantly answered to those who had ‘imagined’ his behaviour in 1948: ‘Although freedom in art is and should be infinite, it stops where information makes it possible to relate facts to real life characters.’ Indeed nobody has a right to distort historical facts or to have people write things they could not possibly have written. Ariel Dorfman has a right to write about how he views the Venezuelan government. But why should he present it as Allende’s perception, thus making him one of those who criticize Nicolas Maduro? Dorfman cannot ignore that the way he uses the figure of Chile’s former President, even under cover of an ‘imaginary letter’, is ethically highly questionable. 1 Published in the United States by The Nation on 2 February www.thenation.com/article/venezuela-maduro-chile-allende/ and in Belgium on the Barril website.